Yesterday the Council of Truth had an emergency meeting that brought three notable figures from legacy clans into the Tower of Truth. Aideen Landau, Leader of The Unionists Clan (who recently liberated 4 Holes from Omni-Tek control), Sister Elsabeth, Leader of Gaia Clan and Xeavier Humbold, Leader of New Dawn. The main focus of the meeting was the CoT stance towards the situation in Borealis after the Omni-Tek occupation. 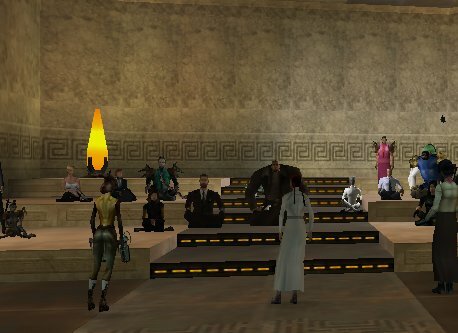 There were a few guests which were not members of the council, among them Commander Windguaerd, Leader of MD - Special Ops who was there at the request of Lady Xaun Miyamoto, Leader of Aethyr Knights Clan to provide a stategic report about Borealis. Strong emotions ran in the council chambers, some leaders calling for the liberation of the former neutral town, others like Simon Silverstone saying to leave the neutrals to their own fate. The meeting lasted approximately 2 hours. Tussa: Can everyone hear us? Even the ones in the back? Jasper2002: I see Windguaerd brings an entourage larger than the assembled representatives *laughs"
Windguaerd: It is called a security detail, or have you forgotten the problem with the Legion that broke in? Astera: Hello Everyone. Before we get this meeting underway, there will be some strict rules enforced today. Astera: I know quite a few of you are emotional about the neuts but talking out of turn and not staying on topic will not be tolerated. Astera: Clans are NOT permitted to join today so as to not swing votes. This will have to be done during a regular CoT session. Astera: Please stay on topic and should you have any questions, please (as usual) raise your hand. Astera: that is all. Thank you. Tussa: We'll start today's meeting with Mr. Landau and the Unionists. Tussa: We expect you have a statement to make, Mr. Landau. Please, you have the floor. Tussa: nods at Icata and jots her name down on the comment list. Landau: sighs and stands, groaning slightly as he cricks his neck from side to side. Landau: I have little... interest in turning this... into a speech. So I... will be as concise as... is possible on the matter. As you all... are aware by this point... I and my clan launched... a successful offensive on Omni-Tek... holdings in Four Holes. To be... completely honest, the plan... was hastily conceived.. but our forces were... victorious. Landau: Many have questioned... my actions, and the fact... that I did not consult with this... council. To those... who wish to say that... the actions of my clan... are outside of the scope... of my authority... I remind them that I... have no love for this council... and give my presence here only... as a token of appreciation... for what it *may* accomplish. Landau: But to look over... the deeds of recent months... this council has accomplished... very little. Save bickering... and anger... and mindless debate. And this has... bothered some... to no end. Least... of all, myself. Landau: To those who are... concerned of the Omni-Tek... citizens still within... Four Holes. They have chosen... to stay there of their... own volition. We have offered them safe... travels, and told them... to depart. But they remain... and attempt to fight our forces. For... whatever reasoning they have. Landau: Otherwise... I have no statement to give upon... the subject. Save to say... that for those who would... face me, and decry... the actions of my clan... then I say in turn... to look at your own reflection... and ask yourself... "What have I become?quot;... for what we have accomplished... is nothing less than what any member... of this council... should *strive* for on a daily basis.... but does *not*. Tussa: I want to use this opportunity to congratulate the Unionists and give my utmost repsect for the accomplishment. Tussa: On behalf of my clan. Icata: Seconded, on behalf of mine. Landau: bows his head deeply. Tussa: Do any of the other legacy clan representatives have a statement? Tussa: Very well. Ms. Hackworth, you have asked to be heard. Floor's yours. Icata: could we perhaps get an agenda or overview for what is to be discussed at this session? Tussa: There were two objects on today's agenda. Tussa: The first one was already covered. The second one is the one everyone is waiting for, I'm guessing. Tussa: The CoT stance towards the situation in Borealis after Omni-Tek moved in their forces. Tussa: If there is time, we may approach a third subject, concerning Omni-Tek's moves itself. Tussa: So without delaying any further, we should move into the neutrals question. I know some here do not have a lot of time, so please, prepare your statements and be ready when your name is called. Tussa: Send me a private message if you wish to comment and you'll be called. Tussa: We'll start with Ms. Hackworth. Icata: Omni will eventually envelop them. Icata: I view the Omni move on Borealis as an opportunity to garner some neutral support. Icata: Whether or not we need their support is not a question in my mind... it is simply the right thing to do. Tussa: I would like to ask those who are sitting furthest away from the center, where Mr. Landau sits, to move a little closer, so we don't have to shout and so that everyone can hear. Tussa: Yes, Jasper, I've noted your wish to comment. Your name will be called. Tussa: Next up is Commander Wagner who on request of Aethyr Knights and Ms. Miyamoto will give his assessment of the Borealis issue. Tussa: Please wait with that comment too, Jasper. Windguaerd: Thank you Miss Tussa. Windguaerd: Good afternoon members of the council. Today I present to you my military assessment of the situation in the former neutral town of Borealis. Windguaerd: Let me begin by stating that even if the neutrals united and gathered all their strength their chances of retaking their town on their own is low, I calculated they have about a 15-20% chance of winning, but only a 5-10% chance of holding it afterwards. Windguaerd: Mind you these calculation does not include any significant clan support since the neutrals have not officially asked for our help. Windguaerd: Borealis is a perfect place from where OT can rally and deploy troops against the clans, they are much closer to OA and WA, also through the Jobe Whom-Pah they can gather a large number of forces from Rome. Windguaerd: It was a good military strategy, if they can hold Borealis that is. I feel sympathy for the neutrals, the most valuable of their towns have been taken. Windguaerd: However...Borealis has now become a security risk for the clans. If the neutrals can't take it back, I believe it falls to the clans to liberate it and create a new 'buffer' zone between the omnis and us there. Neutrals would be welcomed of course. Windguaerd: The bottom line is...we cannot afford for Omni-Tek to keep a foothold on Borealis, they must be pushed out, by either the neutrals, or us. Windguaerd: Thank you for your time, I shall remain with my security detail to listen to the word of the council on this matter. Tussa: Next up is Jasper of Cerberus. Tussa: Ms. Hackworth, if you have a direct comment to Cerberus' reply to your comment, please take this moment to do so. Icata: Mr. Jasper, you claim that neutrals side with OT. Icata: and I for one am not willing to condemn an entire community based on the actions of a few guilds. Icata: majority or not... you seem to have already written off all neutrals. Jasper2002: I think the CoT should wait, and stay it's hand. For too long the Neutrals have held their Neutrality as a defense to both sides for their actions, even when clearly seen to be assisting the Omni in incursions into Clan territory and in attacking Clan bases. Almost without exception they have sided with Omni forces, and now that Omni in return have moved troopers into Borealis "to assist in their defense" they cry foul. Well now it is time for them to make a choice. Do they want to remain Neutral, Fight Oppression of the Omni, or stand up and be recognized for what they are, Collaborators fighting under a supposed flag of Neutrality. I think the Omni Troopers moving into is a good thing, the time is now for the Neutrals to truly decide, and that we should assist them in any decision they make. If they chose Clan, we accept them, if they stay Neutral then we will help them clear Borealis, but if they take up with the Omnis against Clan targets again then they can be damned to hell, or they can go Omni. Humbold: Please, catch your breath young man! Tussa: Next up we have Mr. Maluszkchy from Fist of Chronos. Malusz: I urge the Council to please consider using diplomatic channels. The Unionists' move are bad enough as is to not want to fuel the fires of war even more. In the end, peace is what we all aspire for, and violence in the case of Borealis will lead only to further violence. Tussa: Next is Fayelure of 3305 Local. Fayelure: Traditionally, neutrality is defined as the non-participation in armed conflicts between other states or parties. Fayelure: I believe the Interstellar law of neutrality contains the provisions that must be observed by the neutral states in times of armed conflict between other parties. Fayelure: The provisions for the conflicting parties must be observed in the same context. Fayelure: For the most part, these concern the right of the neutral parties to be left undisturbed during such conflicts and their obligations of impartiality and non-participation. Fayelure: In practice such obligations do not interfere greatly with the freedom of action of neutral parties. Fayelure: These include the obligation to defend its neutral status by the use of force if and when necessary. Fayelure: Personally, I do not feel neutrals are neither omni supporters nor clan affiliates, they are neutrals and area asking to be left out of the larger conflict. Fayelure: as well as interfering with the financial standing of the neutral parties who reside and do business in Borealis. Fayelure: For example, the only Superior Bookstore on Rubi-Ka is in borealis and will be visited few clan members while Omni-Tek controls the city. Fayelure: This is a clear infringement on neutral rights and neutral freedom of action. Fayelure: If they need help from anyone who is not neutral, they must first show an intent to enforce their own neutrality as well, then request it specifically. Fayelure: If Omni-Tek is forced out of Borealis, we must continue to observe their state of neutrality in that city. Fayelure: ...not necessarily protecting it of our own volition. Tussa: Next up is Ms. Kayisa from RKA United. Kayisa: It is the word we swear our lives to. It is the concept that holds us together. Kayisa: The Neutrals exercised their right to Freedom from both Omni and Us. How can we not respect that choice. We who value freedom so highly. Kayisa: Now their freedom is at risk. Kayisa: Omni has begun the first move in what will be a larger war. Kayisa: A war with us as the targets. Kayisa: Omni has struck at the weak point. Kayisa: We have an opportunity. Kayisa: We can gather in the neutrals into our fold. We can work for our own defense. Kayisa: We have the initiative. We can prepare for the war to come. Kayisa: Tell your families. Tell all who are non-combatants to take to the hills. War is inevitable. Our choice is do we fight now and gain allies? Or do we wait and stand alone. Kayisa: Mr. Humbold has often spoken of the might of Omni. Kayisa: We must support the neutrals. For to not do so will weaken us. For we will lose the neutrals. Kayisa: They will again become the confused anarchy they were before and strike at both sides. Kayisa: Thus I ask you to set aside the past and look to our future. Our children's future. Kayisa: RKA cedes the floor. Tussa: And we don't want to sit here all night. Tussa: Mr. Carogelw, you're up. Tussa: Mr. Humbold, you're up next. Humbold: I have an... Emm... Statement from Simon Silverstone... I will do my best to leave out the... Harsh words so to say. Humbold: This message was sent to Ruth Montezuma. Why he sent it to her, and did not say it in person, is not something i understand, but you all know him. Humbold: It has come to my attention, that the omni's have planted their dirty feet in Borealis. I could care less, if the bosses from omni Prime went on a shiny assed parade trough the town, as my love for the neutral lapdogs has never been lower. Humbold: Their continued lack of actions against the corporate slime dogs have always been known, Even when one of their mud holes have been overrun. Why should we care now? Humbold: The spineless rats of Borealis do not even got the guts to stand up, without the backing of us, the clans, so why should we even consider helping them? Humbold: If they want our help, then tell them to join the clans, and start gathering omni skulls, if they are not to busy sucking up to the pony's. Humbold: If you, want to play with the freaks of omni-tek, then do so on your own accord. I am to busy to be concerned about some whining neutrals. Windguaerd: mumbles "Sentinel wisdom at work...yeah, that Silverstore..."
Tussa: Go ahead, Mr. Humbold and thank you for relaying the message from Commander Silverstone. Humbold: As for New Dawn, then you all know our view towards a possible military encounter with Omni-Tek. We will not support any attacks, or military actions of any kind. Humbold: Certain people have not given their full support, and there is also another matter, which will have to be resolved before we will even consider joining military actions. Aeylla: mumbles something about NLF. Tussa: Ms. Miyamoto, you're next. 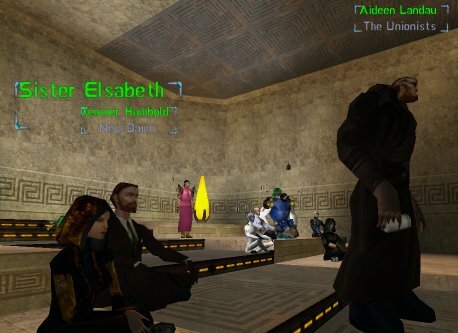 Xaun: Firstly, I would like to congratulate Landau and the Unionists on their swift maneuver and lend my official support to their cause of holding 4 holes for the clans. Secondly, I would like to thank all whom have been standing up to Omni-Tek on any front be it in form of Intelligence gathering all the way to fighting against the Unicorns with me in Borealis. Xaun: We are at a sad junction in the life of a Rubikan.. but a good one for Clan. Yet a dangerous one for all who live on this planets future. The Omni-War Machine's gears are cranking..
Xaun: They slaughter Neutrals and Clanners in the Streets of Borealis.. This has caused many to seek solace in the clans.. I have received a number of them into my own fold. Xaun: This can only serve to swell our numbers... however.. the neutrals in my eyes are as any one of the nine dividing factional party lines we all support in this council. A 10th faction if you would.. Their views are not that different than Humbolds and New Dawns mixed with a lil Gaia and perhaps some sentinels too depending on which you speak with. Xaun: Now that is not to say any one here or there would accept such a thing.. but it is no different to me. I have received the word from a number of Neutral orgs whom have accepted Clan friendship in the past and some who are clamoring for it now. The Wolfs Brigade lead by Berael for one. 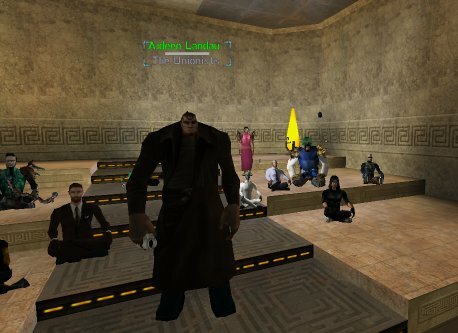 Xaun: I have met with the Newland City Rep and in a short brief discussion they made it perfectly clear that they seek audience with us and our representatives at the end of today's Session. I am prepared to meet with them I ask the council to decide whom else they will send to meet along with myself. Tussa: Ms. Croteau, you're up. Tekerton: It doesn't take a think tank to realize that the positioning of OT in Borealis is a strategic nightmare for the Clans. Speaking on behalf of reputable businesses like the Mockers, I can sure tell you that it is a financial burden as well, in terms of shipping and manpower. Sure, in the end, we'll sell our goods, we'll make our money, but what of the communities, our constituencies? Tekerton: We deign to claim that we will "Liberate" Borealis? We proclaim to do that by implementing a second occupation? Can you not see this is no better than Omni-Tek? Who do we do this for? The Clans of course, but is this the Best of all possible solutions? To risk further conflict and lose the support of the locals? To lose yet another city entirely as it is reduced to smoldering pile of rubble? Tekerton: I say that in every neutral there is a Clanner or an Omni-Tek employee waiting to break out. If I'm right, and we proceed with a full scale assault, then we may as well buy a pile of OT weapons and armor and start handing it out to the locals. If I'm wrong, then we should observe their independence, to include their independent choice to be occupied or obliterated. To follow Any other course of action is to wear the face of Omni-Tek and sing the song of Freedom of the Clans on tainted lips. Tekerton: The knowledge of the occupation can work to our advantage. In this way, we Know where the OT's are and where they will strike. We should protect the entry points accordingly. There can be No Excuses for allowing them to march through the Whom-Pah system without us knowing the second the first boot heel creaks. If anything, it offers us an excellent opportunity for intelligence gathering. Let's not mince words here...financial vitality is the heart of this entire conflict; we would be fools to ignore that point and fail to exploit it. Jasper2002: thinks that handing it out involves a cost, payable to The Mockers. Ever the businessman, but never the arms dealer? Tekerton: To enter into a full scale battle for Borealis will serve us little more than a reduction in customers, citizens, and life on Rubi-ka. To do nothing signs our death warrants. We are charged with the responsibility to find another way. The words we choose, the message we send, will make a greater impact upon the citizens of Borealis than any megaweapon on any space platform. Tussa: Mr. Trgeorge, you're next. Trgeorge: We all agree that Neutrals should be respected as neutral, should they wish to be that. Trgeorge: Other things will have to change too. Maybe the sorest item on that list is this city, Tir. Trgeorge: Silverstone made a tactical decision. Only clanners allowed, high security at gates and Whom-Pah, moving grid out as potential entry point. Trgeorge: But that's one of reasons Neutrals are more keen to support OT. And it turned Tir into ghost town. Trgeorge: ...tail. He holds this city and is content with that. No wonder, he can't do anything else on his own and his grace prevents him to gather allies. Trgeorge: On the other hand, I'm sure those of you gather here wish to act in all clanners best interest. Trgeorge: Some call this diplomacy. Some call it stick and carrot. It doesn't matter really how we call it. Trgeorge: This situation is opportunity for us. But since we're talking about cooperation, we need to respect other party feelings too. Trgeorge: Which means, that if neutrals ask us, we assist them and then move out. Totally. /v If they don't ask us and fail, we have Borealis for the taking. Of course we might always consider giving it back to Neutrals all the same. Tactics and diplomacy again. Trgeorge: And if Neutrals settle down and turn Omni...Let's take city and keep it. Plain and simple. Trgeorge: But we need to plan the least favorite option of those three first. Even in that case we gain something. Trgeorge: In an unlikely even of Neutrals going against OT on their own and winning, we still score. We showed Neutrals respect with not interfering, unlike OT. Trgeorge: that would be all. Tussa: Jasper, you have the word. Jasper2002: Regarding Mr Humbold and the Omni threat, is it so great?, can we not counter with our own collaborated forces The only truth regarding the Clans is our resolute goal to remove the Omni threat. If you, Mr Humbold feel that we are not up to the task then what do you propose that we should do?, Better training, better equipment or a single voice that rallies those that would fight the omni threat? Jasper2002: Be ready?, Should I bake a cake? Tussa: Reminding everyone now that we are not taking any more speakers on the list except those already on it. We have time issues and still have the vote at the end. Tussa: Short comment from Ms. Miyamoto. Xaun: Thank you that will be all. Tussa: This is not the time and place for a vote over that issue, but will be put to the regular June CoT meeting. Tussa: Ms. Bane, you're next. Copperneedle: First, I must remember to get a new implant for my ear... What am I hearing?, Who are we? are we not those that fight for what it is the the neutrals enjoy? Copperneedle: silverstone would love to just allow the omni to venture to tir, simply to give in the chance to flex his muscle... WE ARE CLAN. we fight for freedom and our own independent lives... that is exactly the neutrals way of life we have fought for them... or at least their ideas... do we stand back and watch that burn? Tussa: Sister Elsabeth, you're next. Elsabeth: nods and stands slowly. Elsabeth: Brothers and sisters, I will be short and to the point. Gaia cannot and will not support nor aid those who call for open warfare with Omni-Tek. For those who seek open war. Go. Throw your lives against the Omni war machine. Your children shall weep and mourn your loss as your blood stains the earth of Rubi-Ka. Elsabeth: Now more than ever I ask the clans to think of Gaia's request for funding to terraform our own lands. Far away from the reach or influence of Omni-Tek. we are quickly approaching a time, I believe, when negotiations, or diplomacy will yield any favorable results. If we have not already. Elsabeth: People forget that me and my brethren once sought to fight Omni-Tek. And we tried... and we learned through bitter losses how futile the effort. I will not ask my people to lay down their lives in a war that cannot be won. Elsabeth: The Neutrals of Rubi-Ka are welcome to join with us if they truly seek to escape the madness that seems to be creeping into the minds of Omni-tek, and my fellow brothers and sisters who seek bloodshed. Elsabeth: The loss of their homes and livelihoods has shown them the reach of Omni-Tek and we will aid them if they desire to relocate and regroup. We will not aid them in open war against Omni-Tek. They have lost Borealis. They still have their lives. And what is more important than that? Elsabeth: I also call upon all who seek to avoid destruction to join with us in our quest to terraform our own lands away from the interest of Omni-Tek. Elsabeth: I will close by asking those who are hell bent on war to look to their children and ask themselves if they can stand to see them crushed under the heels of Omni-tek's boots. I have. And choose not to repeat the experience. Tussa: Short comment from Commander Wagner. Windguaerd: After listening to the voice of the council, I think I have come up with a reasonable military solution. Some don't care about the neutrals, while others care a great deal for them and Borealis. Windguaerd: Intelligence gathering is fine, if it does not come at the cost of our enemy gaining a tactical upper hand. If they neutrals ally with us, they become clanners...maybe not officially, but in the eyes of the omnis. Sure this would be to our advantage, however it would appear to the neutrals we are using them for our own cause selfishly. Windguaerd: Perhaps a reasonable offer can be put forward by the council. We help liberate Borealis, and afterwards it becomes a neutral town again without any debt to the clans. This of course will mean we are going to spend time, effort and resources...but in exchange I feel neutrals will see our cause is right and a number of them may join our side in turn. Windguaerd: Staying out of the situation may work out as well, however I don't see them strong enough to retake Borealis on their own. Which means it would remain a tactical stronghold for Omni-Tek against us, can we really afford that? Windguaerd: By liberating the town from the corporate grasp we can raise morale on our side, display a positive image of the clans with the neutrals and remove a threat to our borders. This I think would be worth the time and expense to liberate Borealis. Windguaerd: As far as Tir and Silverstone allowing neutrals to once again be free to trade here...unlikely. The only way I see this happening is if the Sentinels leave our capital to another Legacy clan to protect, the Knights would be the best suited for this task. The issue of course would be, how do we convince the Sentinels to leave without leading to a civil war? Windguaerd: I do not see a clear solution to the Tir issue unfortunately. Windguaerd: Thank you for your time council members. Tussa: Last statement for today comes from Ms. Gorslin. Astera: Mr. Landau is right. This council, no matter what any of us have done, is far too diversified to accomplish anything. We now know that there is an impending war. You do not have to be able to read tea leaves to see it. Astera: This council needs to unify for this. The Clans future is precarious with Unicorns so close to our beloved Athen. The old days of bickering should be struck down and all future initiative be focused on that and that alone. Neuts are of no concern. They have made their bed with Omni. If they want to join...we have applications. Astera: If they want to be neutral, let them handle their own problems. We all live with the knowledge that any of our cities can be over-run at any time without so much as a comment from the ICC. We decided to fight against it. Let them make their own decisions. Astera: If the neuts want to support us, they will find a way. This council FOR THE CLANS can barely govern itself, we have no room for more undecided. If your clan wishes to help them, then that is entirely up to you. This Council cannot afford to worry about people that may or may not like us. Astera: A vote on Neutrals only solidifies my statement because do you honestly think that if this council votes, I will have anything to do with the neuts? How about Jen or the rest of the pro-Sentinel Clans? Astera: I say to hell with the vote. Leave it up to the individual Clans to decide. Astera: If we SOMEHOW come up with a compromise, the neuts are obviously too weak to keep OT out. Borealis will have to be Clan Occupied and how many of them want that? We'll be back to square one. Trgeorge: and you speak of unity? Astera: looks at Trgeorge and chuckles. Kayisa: This council can not afford to drown in rhetoric and inaction. This assembly needs to form a general policy for it's members to follow. That's our job as representatives. Astera: debate it if you want but its people like Humbold, Elsabeth and Mr. Landau that will have to put forth the troops for it. Kayisa: I asked for the floor but you are last speaker. Tussa: However, this meeting must end with a vote, as called for in the beginning, and so I let the word to Fayelure. I will remind the representatives to keep in mind their clan's political affiliation, not their personal feelings about the matter before they vote, and also that the neutrals have not officially approached the clerical staff pleading for help. Tussa: Faye...take it away. So to speak. Xaun: COrrection Tussa they have..
Landau: slowly stands, letting out a deep breath. Landau: I will be... abstaining on this vote... and I must depart... for other matters... I thank you all... for the support... and hope that perhaps... this council may yet... prove to be one of action. Tussa: And once again, congratulations, Mr. Landau. Tussa: Please allow a few moments for the vote to be tallied. Windguaerd: Thank you for your time, duty calls. Good day to all. Tekerton: TELL THE NEUTS TO RALLY AT TIR!! TIR REVITALIZATION IS A MUST!!!!!! Astera: one moment while I tally the votes. Malusz: Who has decisive votes in the clerical staff? Tussa: No no...I most certainly do not. Astera: let me recount. I think someone voted that wasn't able to. Kayisa: The Legacy leaders have left us though. Tussa: Jasper, there is no such thing as a CoT leader. No one in the clerical staff holds more "power" than the other members. Astera: two people voted that were not allowed to vote. Tussa: It all sorts itself out. Astera: I will post full details of this on the forums for debate. Kayisa: Does it break the tie? Carogelw: who wasn't allowed to vote? Tussa: Please state who voted who do not have a vote, please. Xaun: Windguaerd did not have a vote? Tussa: glances over at Vari, lifting a brow. Aeylla: I need to take my leave now. Astera: Mercury Dragons disbanded and Windguaerd left Rubi Ka. Astera: MD - Special Ops has not joined that I know of. Xaun: Who will be meeting with the Neutral council with me? Kayisa: Didn't they join last meeting? Kayisa: I'll go with you. Astera: I wasn't aware that MD special ops joined. Tussa: I suggest that Jasper goes with as well. Tussa: MD Special Ops has not joined the Council, no. Fayelure: To remind you of the outcome, option 1 won the vote. Fayelure: That was: 1) Issue a statement of condemnation of Omni-Tek regarding the violation of neutral rights; offer NO assistance that violates the laws of neutrality. Tussa: So...Ms. Miyamoto, Kayisa and Jasper goes to meet the Newland Council? Xaun: I found option to be no action? Astera: no action. no. This, however, does not mean that your clan can't do something. Kayisa: It means we slap Omni-tek's hand, say bad puppy and sit on our hands passing gas till they come for us. Xaun: I will bring this message. Xaun: Kayisa and Jasper let me know when you are ready. Tussa: nods to Kayisa and Jasper. Tussa: You should probably go with Ms. Miyamoto right away. Kayisa: May I just state that the ICC folded without firing a shot. Likely this means any aid you'd of hoped for from the ICC isn't going to happen. Tussa: I hear the neutral's feet are burning hot. Shouldn't keep them waiting. Tussa: No, Carogelw. We simply remove the votes. Tussa: It's how it's always been done. Astera: no, I just delete the votes. I know who did it. Astera: their names are attached. Kayisa: Miyamoto ask them if they want us to join them in Newland. Astera: nice to meet you, Sir. Have a great day. Tussa: Well, I'm off too. Tussa: Remember the meeting late this month. 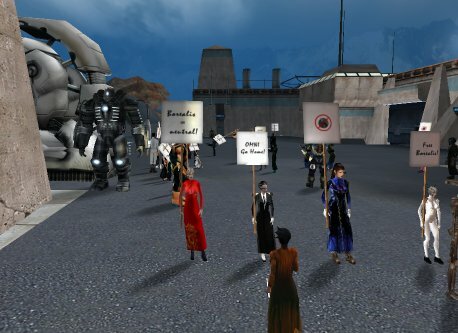 In the end, the council decided by mayority votes to issue a statement of condemnation of Omni-Tek regarding the violation of neutral rights and offer no military support. I wonder if non-CoT clans will abide by this decision, or make a move on Borealis to either help the neutrals or try and take it and convert it into a clan town. Both Sister Elsabeth and Xeavier Humbold had agreed to an interview, unfortunately I was not available when they had become free to meet me. I will try to get an interview with them in the near future. I spoke with Minister Jujuwalker from the Newland City Council to get a comment from him, however he declined to speak officially at this time. With large crowds of neutral protesting every day by the whom-pahs in Borealis and talk of neutral uprising in the streets of the omni occupied town, how long will it be before the situation becomes explosive? What seemed like an easy target for Omni-Tek and their Unicorn Company may just become the biggest mistake of the 3rd rubikan war. Will the neutrals survive these times of trouble in Borealis? or will Omni-Tek hold on to their newly acquired territory by any means necessary? Only time will tell. I can assure you my readers, as I find out more I will report! This is Reporter 'Noticiero' Rivera, and this has been 'A Rubi-Ka Exclusive'!